Establish your retail business and generate more profits with the Lobby Retail, Merchandising & Marketing Pack. Featuring testers and sellable products of Xtreme Lashes color, lash care, skincare, and accessories, this comprehensive pack also contains Marketing / Sales tools and tester displays designed to showcase essentials and best-sellers. This product display and inventory pack has a retail value of almost $4,000 and saves you 25% versus if you were to purchase all the items separately. Add additional revenue to your business with Skin Renewing™ Concealer- a breakthrough in care and color from Jo Mousselli® Beauty. Skin Renewing™ Concealer is compatible with Xtreme Lashes eyelash extensions. This convenient retail kit contains 12 units of Skin Renewing Concealer in four shades (3 of each shade) plus essential display and marketing tools. The display’s compact 4.75” x 4.75” size makes it easy to display on narrow countertops and/or salon shelves. A combined value of $469. Insider Tip: Display one of each shade and sell the rest! Additionally, promote purchase of this product by incorporating it into the eyelash extension application process. Place a Skin Renewing Concealer display in every application room so you can apply this product on your client after the application to diminish any redness or uneven skin tone before she leaves your salon. Limit one per business location, plus one per Stylist connected to the business location. Add additional revenue to your business with Skin Renewing™ Concealer- a breakthrough in care and color from Jo Mousselli® Beauty. Skin Renewing Concealer is compatible with Xtreme Lashes eyelash extensions. This convenient retail kit contains 12 units of Skin Renewing™ Concealer in four shades (3 of each shade) plus essential display and marketing tools. The display’s compact 4.75” x 4.75” size makes it easy to display on narrow countertops and/or salon shelves. A combined value of $469. Earn additional income by retailing the new Amplifeye® Advanced Lash & Brow Fortifier with this conveniently packaged Retail Kit. This Retail Kit comes with 3 units of Amplifeye Advanced Lash & Brow Fortifier, a versatile White Display Block, a Marketing Literature Easel, and a 25-pack of Amplifeye Advanced Lash & Brow Fortifier Brochures. This sleek block display design can be positioned alone for a smaller shelf footprint, or combined with other Xtreme Lashes® Retail Block Displays to create a seamless merchandising display, customized for your salon. Insider Tip: Display one box of Amplifeye Advanced Lash & Brow Fortifier open to showcase the beautiful and luxurious packaging. Also, make sure to have the informative brochure within reach of the sellable units to allow customers to learn more about the science behind this new formula and its compelling results. Offer your clients a way to extend the life of their lashes and improve lash retention between relash appointments by retailing the Xtreme Lashes Protective Coating with this complete Retail Kit. This kit comes with 3 units of Protective Coating, a versatile display block, easel, and a 25-pack of Aftercare Guide Brochures to explain how your client can use the Protective Coating to extend the life of her lashes. Insider Tip: This block can be combined with other Retail Kits and a la carte tester block displays to build custom display arrangement to fit your space and retailing needs. If you are doing Xtreme Lashes lash extension applications, it should be a given that you’re also retailing the Eye Makeup Remover & Facial Cleanser, our award-winning and nourishing cleanser formulated to effectively cleanse eyes and face without affecting the longevity of your clients eyelash extensions. This Retail Kit comes with 3 units of Eye Makeup Remover & Facial Cleanser, a versatile display block, easel, and a 25-pack of Aftercare Guides. Insider Tip: This product should be the easiest retail product pitch you ever make. Every lash extension client should leave your salon knowing how to care for and extend the life of her lashes, and equipped with the products to protect her investment (and your work!). Place an Eye Makeup Remover & Facial Cleanser (120 mL) Retail Kit in every lash application room as well as near the register to prompt her to make her purchase. Add additional revenue to your business with the Total Eye Repair Serum Retail Kit. This comprehensive Retail Kit comes with 3 units of Total Eye Repair Serum, a versatile display block, easel, a 25-pack of Total Eye Repair Serum brochures, and 10 sample packettes. The display’s compact 4.75” x 4.75” size makes it easy to display on narrow countertops and/or salon shelves. Insider Tip: Get familiar with your retail products to be able to suggest the right ones for your clients’ needs. Have clients with fine lines, wrinkles, sagging skin, or puffiness around the eye area? Give them a complementary trial packette of the Total Eye Repair Serum. In an independent clinical study, 86% of participants felt significant improvement in skin firmness after just 6 hours of using the Total Eye Repair Serum. Entice customers to purchase Xtreme Lashes Eyelash Extension Compatible Mascara with the comprehensive Length & Volume Mascara Retail Kit. This Retail Kit comes with 3 units of Length & Volume Mascara, a versatile display block, easel, and a 25-pack of Length & Volume Mascara Postcards. This sleek block display design can be positioned alone for a smaller shelf footprint, or combined with other Xtreme Lashes Retail Block Displays to create a seamless merchandising display, customized for your salon. Insider Tip: Display one unit as a tester and sell the rest! Customers that have the opportunity to touch the product and see the brush before they buy it are more likely to make a purchase. Intrigue clients with this chic Retail Kit to help showcase and sell the Lash Densifying™ Liquid Eyeliner. This kit comes with 3 units of the Lash Densifying™ Liquid Eyeliner in Classic Black, 3 units of the Lash Densifying™ Liquid Eyeliner in Dark Brown, a black and gold dual shade display block, a 25-pack of Lash Densifying™ Liquid Eyeliner Brochures, and a Marketing Literature Easel. This sleek display is complementary to other Xtreme Lashes Retail Kits, so it will look great on your shelf with existing products. The specially designed display holds the eyeliner horizontally to prevent tips from drying. Insider Tip: Use the tester to show your clients the two unique tips and the beautiful classic black shade, while keeping the slots filled with products ready to sell. Showcase and sell the Lash Densifying™ Liquid Eyeliner in Classic Black and Dark Brown in one chic black and gold display. This display is complementary to the other Xtreme Lashes display blocks, with slots for a tester and 2 retail units of each shade that lay horizontally to prevent tips from drying. Approximately 6.30” x 6.70” x 1.75”. Add additional revenue to your business with the award-winning GlideLiner™ Long-Lasting Eye Pencil collection. This comprehensive inventory and product display package contains 36 GlideLiner™ Long-Lasting Eye Pencils, 25 GlideLiner Sharpeners, and display tools. Insider Tip: Simply display one, sell the rest and you’re set! We recommend that you place cleansing tools next to this display for clients to use. Additionally, sharpen tester pencils on a regular basis to keep them looking their best. Delight your clients with a GlideLiner™ Mini gift and convince them of the silky-smooth gel formula of GlideLiner Long Lasting Eye Pencil. Hand it out to new clients to familiarize them with the Xtreme Lashes® eyelash extension compatible retail products, reward your most loyal customers, or use it as a promotional tool. The possibilities are endless. The GlideLiner™ Mini Sample Kit contains enough products for you to create ten sample gifts for your clients. Insider Tip: Promote your salon and remind clients to make an appointment by including your professional business card or by wrapping the sample in a beautiful gift box with your salon name. Intrigue clients with this chic black and gold display to help showcase and sell the Lash Densifying™ Liquid Eyeliner. This display is complementary to the other Xtreme Lashes display blocks, with slots for a tester and 2 retail units that lay horizontally to prevent tips from drying. Approximately 4.75” x 6.75” x 1.5”. Showcase tester and retail units of GlideLiner™ Long Lasting Eye Pencil with this compact display. This display features 4 slots to hold tester pencils and 8 slots for boxed units. Approximately 4.75” x 4.75” x 1.5”. Insider Tip: Purchase enough display blocks to showcase every available shade of Glideliner. 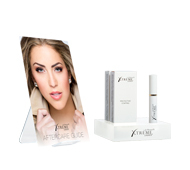 Promote Xtreme Lashes retail products your way with these versatile Display Blocks. Designed without slots, use these Display Blocks to promote products that can stand upright by themselves or to build a custom display. Approximately 4.75” x 4.75” x 1.5”. Insider Tip: Make sure Amplifeye Advanced stands out in your salon by placing this beautiful product on the White Display Block. Increase visibility of lucrative Xtreme Lashes retail products with this sleek tester display. This empty acrylic block contains a slot to feature one tester unit of Amplifeye Lash & Brow Fortifier or Protective Coating and two slots for housing saleable boxed units. Compact size ideal for counters and small shelves. Approximately 4.75” x 4.75” x 1.5”. Entice customers to purchase Xtreme Lashes Mascara by displaying either the Length & Volume or Volumizing Mascaras on this compact tester display. This empty acrylic block contains a slot to feature one tester unit of mascara and two slots for housing saleable boxed units. Compact size ideal for counters and small shelves. Approximately 4.75” x 4.75” x 1.5”. This empty acrylic display contains 2 slots for featuring tester units of Skin Renewing Concealer and 4 slots for housing saleable boxed units. Ideal for counters and small shelves. Compact size. 4.75” x 4.75”. Encourage customer engagement and increase revenue by presenting Xtreme Lashes® retail products in this elegant display cup. The acrylic cup is also ideal for storing your application tools in an organized way. 2.36" x 2.36" x 2.56". Use this white display cup to store applicators or Xtreme Lashes Pens, or to merchandise the Deluxe Retractable Lash Styling Wand, GlideLiner™ Long Lasting Eye Pencil, Angled Brow Brush, and Long Lasting Brow Pen. Use this black display cup to store applicators or Xtreme Lashes Pens, or to merchandise the Angled Brow Brush and the Deluxe Retractable Lash Styling Wand. Increase the visibility of Skin Renewing™ Concealer in your salon by presenting the product in this white display cup. * Note: Display Cup only, products are not included. Elevate Xtreme Lashes by Jo Mousselli brochures and postcards with this acrylic easel. Place next to any display or product to enhance visibility and promotion. Designed with a front lip to hold the marketing materials in place. 2.5” W x 5” D x 3.9” H.
Display the Hydrating Under Eye Gel Patches on this white display easel and remind your clients after application that these rejuvenating patches are available for purchase. The acrylic display is also perfect for storing the Silicone and Lint-Free Under Eye Gel Patches and helps to keep your salon organized. 3" x 4.75" x 7". The Display Easel allows for different ways to retail the Hydrating Under Eye Gel Patches. It has the perfect width to fit two rows of boxes side-by-side, or to showcase the patches by placing them directly on the easel next to one row of boxes. * Note: Display Easel only, products are not included.